STOCKPILING HAY: Farmers across the country are searching for hay to feed cows during the winter. However, this year’s load will cost more than other years as the drought caused farmers to start feeding hay early, limiting forage supply and increasing its cost. Rising cost of hay in parts of the country put pinch on beef producers. Even as USDA has estimated a record corn yield and a near record soybean yield from the 2018 growing season, an important input to the cattle industry has become rather scarce in parts of the country. 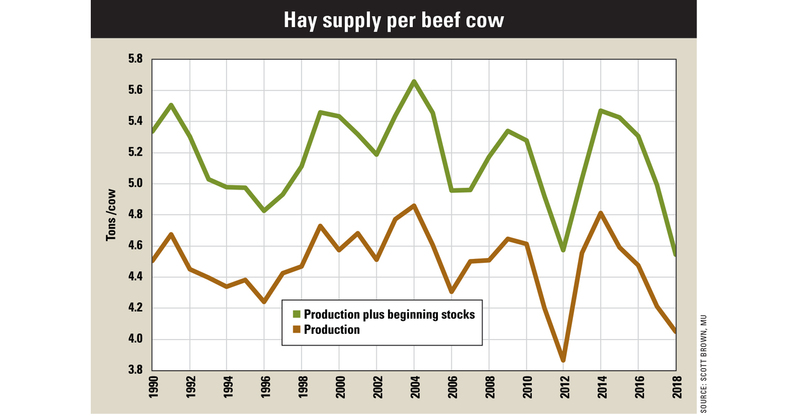 With the August Crop Production report estimating hay yields to be very close to the second-lowest level since 1990, producers in dry areas of the country are struggling to keep the cows fed in many instances. While it is true that the trend in beef cow numbers has been down over time, 2018 began with 31.7 million beef cows, the largest herd since 2009. With hay priced at relatively high levels and in some cases only able to be sourced hundreds of miles away, some calves are entering feedlots and cows are being sent to market sooner than expected. Compounding the issue of lower hay yields is the fact that the area devoted to hay is much smaller in the last decade, and this growing season began with a relatively scarce amount of hay in storage. Just over 55 million acres of hay is expected to be harvested this year, the largest since 2014 but still 10.4% below the 61.4-million-acre average of 2000 to 2010. Hay price data from USDA National Agricultural Statistic Service is consistent with relatively scarce supplies. U.S. hay prices have been at least 10% above year ago levels for every month of 2018 thus far. Price increases have been even steeper in Kansas (+43.7% year to date), Nebraska (+26.6%) and South Dakota (+16.5%). Hay prices in Missouri began the year only slightly above 2017 levels, but that changed in recent weeks. According to USDA Agricultural Marketing Service, the price for good quality mixed grass hay is up more than 50% from the beginning of the year, surpassing levels posted during the 2012 drought. While it is certainly not uncommon for important cow-calf areas of the nation to experience dry weather, less area devoted to hay may cause it to take longer to recover from a situation where many areas of the country are tight on hay supply. During 2008, when the U.S. hay price spiked over 20% in one month during the spring, prices returned to levels from a year ago in just 10 months. In the spring of 2011, prices rocketed up by over 35% in two months and did not return to below-year-ago levels for more than two years. While no two dry weather events are the same, producers should be aware that higher hay prices could be here to stay for quite some time, particularly in certain areas of the country. With calf prices projected to remain under pressure through 2020 due to rising beef production, profit margins will likely become even tighter in the years to come. Brown is a livestock economist with the University of Missouri. He grew up on a diversified farm in northwest Missouri.